In this chapter, Buttorff analyzes the case of the Islamic Action Front (IAF) in Jordan and its electoral strategies during five legislative elections: 1993, 1997, 2003, 2007, and 2010. The party boycotted just twice, even though all five elections used the single non-transferable vote electoral system, one of the opposition's main grievances and motivations for both boycotts. The author shows how the opposition group’s shifting perceptions of regime strength drove the changes in its electoral strategies during this period. 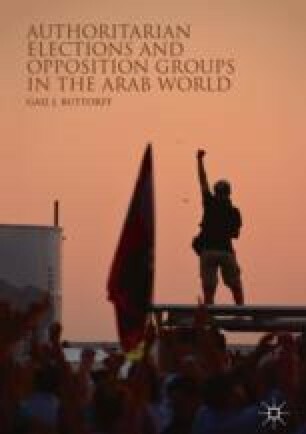 In so doing, Buttorff provides a more nuanced understanding of the pattern of opposition strategies observed in Jordan during this period. Abu Rumman, M. (2010). Jordan’s parliamentary elections and the Islamist boycott. Retrieved October 21, 2010, from http://www.carnegieendowment.org/arb/?fa=show&article=41769. Jaradat, H. (2010). Jordan’s economy: Crisis, challenges & measures. Presented at the 3rd annual meeting of Middle East and North African Senior Budget Officials (MENA-SBO), Dubai, UAE. Retrieved from https://www.oecd.org/gov/budgeting/46382448.pdf. Prados, B. (2003). Jordan: U.S. relations and bilateral issues. CRS Issue Brief for Congress, IB93085. Retrieved April 3, 2011, from http://pards.org/crs/_country/CRSReportJordanU.S.RelationsAndBilateralIssues(August25,2003)Updated.pdf. Schwedler, J. (2010, June 30). Jordan’s risky business as usual. Middle East Report Online. Retrieved from https://www.merip.org/mero/mero063010.